Today I am sharing a really simple recipe for a “no bake” salted caramel cheesecake. I promise this is SOOO good you will hate me forever!! Like most of the desserts, I make it’s a cheats recipe. By cheat I mean it tastes super good but is quick and simple recipe to cook. The Salted Caramel Cheesecake can be two or three layers. In its simplest form, with just two layers of deliciousness, this dessert takes 5 minutes to make. 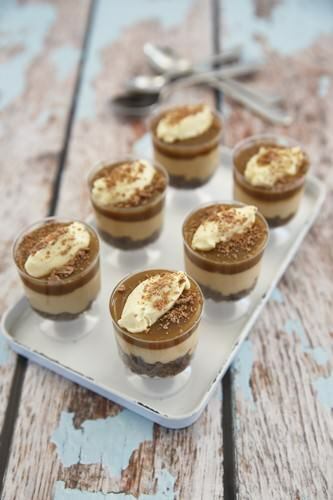 You can spend some extra time cooking a praline topping or adding a layer of salted caramel sauce to the top. I was initially cooking the salted caramel cheesecake recipe for family dessert. I had begun pressing the ginger-nut cookie base into glasses. Then I realised Mr. GG was going to his first ever poker night. I had made six dessert glasses with cheesecake base in the bottom and plenty more base leftover. I had made six dessert glasses with cheesecake base in the bottom and plenty more base leftover. Instead of continuing to make the other six glasses I decided to make a batch for Mr. GG to take along to the poker game. In the cupboard, I had some plastic wine taster glasses. I’m not sure where the plastic glasses came from, but I knew they would be perfect for the dessert. Place the ginger nut cookies in a food process and pulse until crushed. Add the melted butter and cinnamon to the cookie base and pulse until the butter is evenly distributed. Press the mixture gently into serving glasses. 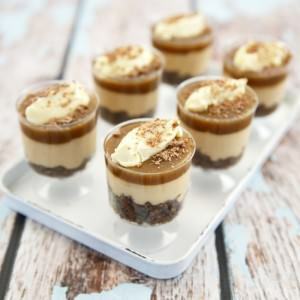 Place the Nestle Caramel "Top & Fill", cream cheese and lemon in the food processor and pulse until smooth. 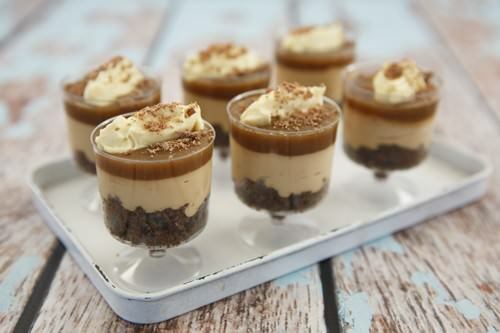 Pipe or spoon the filling into the glasses to form a second layer. 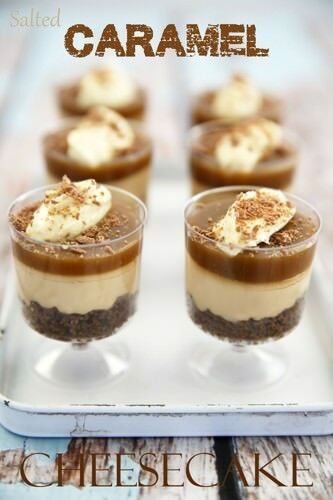 Refrigerate the cheesecakes for at least 3-4 hours if serving in glasses. If you are making a large cheesecake in a springform pan you will need to refrigerate overnight to enable the dish to set. Alternatively you could add gelatine to set the cheesecake. *Please note, I prefer the cheesecake without gelatine and served in glasses. Simmer the mixture for 4 minutes whilst stirring. Allow the caramel to come to room temperature. Pour a thin layer of caramel over the cheesecakes. 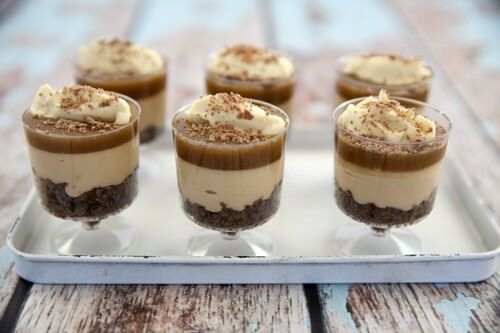 Serve with cream and grated chocolate if desired. 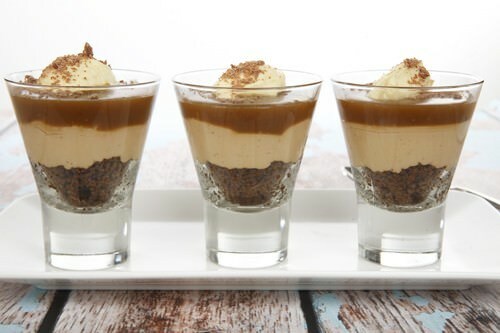 Please note this recipe is designed to be served in glasses as an individual style dessert. It is not a firm baked cheesecake. Since I prepared this dessert, I have made two other desserts in the plastic wine glasses. The first was this Chocolate Mocha Mousse and the second was this Chocolate Raspberry Brownie Trifle. I’ve found that these are popular for BBQ’s and parties. The plastic wine taster glasses can be found at the “Reject Shop” for Australian readers or here on Amazon for those in the US or elsewhere.